The Environmental Protection Agency is hiring for ethics positions as its chief ethics official has grown more concerned about mounting reports of misconduct by Administrator Scott Pruitt. An agency spokesman on Tuesday confirmed to Government Executive the existence of a letter to the governmentwide Office of Government Ethics sent on June 27 from Kevin Minoli, deputy general counsel and designated agency ethics official, acknowledging multiple referrals of complaints about Pruitt’s behavior to the inspector general. 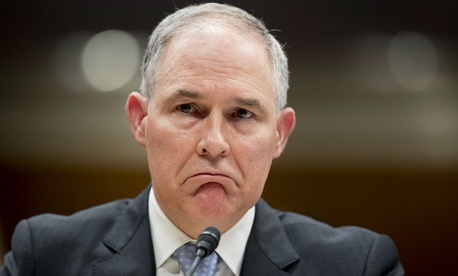 The New York Times had reported on Saturday that Minoli had reversed an earlier stance largely defending Pruitt against such accusations as accepting inexpensive lodging from a lobbyist, overuse of first-class travel, and overspending on personal security. Minoli’s letter responding to concerns raised in a 2016 OGE program review and a letter this April by acting OGE chief David Apol also revealed that last summer’s hiring freeze had caused a depletion of EPA’s ethics office staff. Retirements and other temporary departures had reduced it to only one full-time employee, his letter said. To handle the current expansion of issues being raised, he plans to rebuild it to six staffers. “These additional resources will focus on expanding the availability of ethics officials to provide ethics advice and increasing the support of [designated ethics officials] across EPA,” Minoli wrote. Pruitt, meanwhile, faces as many as 13 investigations between the IG and congressional committees, on issues such as his $43,000 sound-proof booth in his office and alleged use of agency staff to run personal errands. His issues have only grown in visibility. On Monday, CNN quoted former Pruitt operations deputy Kevin Chmielewski saying that Pruitt’s staffers regularly met to “scrub” the administrator’s calendar of any entries that might prove politically embarrassing. Some two dozen, meetings, events or calls were omitted, CNN estimated.